It is early March and post-Super Bowl conversations have been replaced by post-Oscars conversations. Sheena deals with these conversations in the setting of sunny Southern California as Cortney is still digging out from under the snow brought by the 2016 blizzard in the east. Despite the coastal distance, we find ourselves dealing with similar popular culture references in ways that recall Benedict Anderson's notion of "imagined communities" wherein the arrival of print capitalism - this very core concept that we might be reading from the same major news outlets via newspapers – contributed to the idea and identity of one nation. During and post-Super Bowl, there were conversations not only around the Broncos and Panthers but also around notions of race. Sheena teaches a course on sports, culture, and power so she felt especially attuned to conversations about whether Cam Newton's supposed poor sportsmanship-like conduct after losing would be interpreted similarly if he were a White quarterback. There were also conversations concerning Beyoncé’s takeover of the halftime show and the attention it brought to her recently released video for "Formation" which brings issues of race and police brutality to the forefront. As Super Bowl madness died down, observations and reactions to caucuses and debates began. This led into conversations around whether feminists had to defend choosing Bernie Sanders over Hillary Clinton - again bringing together the body embodied in the political with the body politic. And then we entered into popular culture discussions of Chris Rock’s hosting of the Oscars. This is a small snippet of a specific time and specific places. Yet, we think about so many critical issues around race, gender, community, identity, embodiment, discourse, and power. If we zoom out to look at the many global flows impacting these conversations and the technologies that allow these artifacts, ideas, and conversations to connect to groups, we must take pause to think about how much anthropological perspective has impacted the ways in which we see the world. Cortney has thought about this a great deal in the past year as she attends medical meetings and seminars for research, where sometimes the numbers are more important than the stories behind them, and she wonders how to bring the stories and nuances of them to the fore within these spaces. We have found anthropology applied in the most mundane and everyday of spaces as well as in the most epic (depending on perspective and timing). In much the same way, we take a step back to think about how much anthropology can be applied to unexpected spaces. And perhaps in opening up the conversation, we want to ask whether anything should be unexpected at all. In 2014, we began to brainstorm an edited volume for students and practitioners of anthropology. It would bring together a collection of essays from anthropologists inhabiting spaces that might not be expected in anthropology. Through this process, we encountered authors and research that brought the concepts and methods of cultural anthropology into topics and places such as veterans' health, finance, university professional development, nonprofits, end of life care, museums, intellectual property law, and yes – outer space. 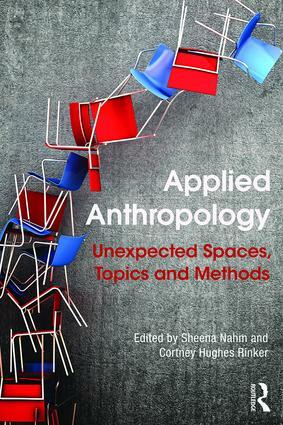 Even now, as we leaf through this volume and the work of the contributors to the final product, Applied Anthropology: Unexpected Topics, Spaces, and Methods, we consider how much we might engage our colleagues and friends – some of whom have no background or explicit interest in anthropology – in the concepts and principles that underlie this is very volume. Sheena Nahm is an Adjunct Professor (Anthropology and Sociology) at The New School for Public Engagement, USA. She is also Director of Senderos, a parent and community engagement program. Cortney Hughes Rinker is an Assistant Professor in the Department of Sociology and Anthropology at George Mason University, USA.